Royal Crown Derby’s success for over 260 years has spanned over three factories in varied locations around Derby, England. The stunning fine bone china giftware and tableware is still made at the Osmaston Road factory today which has been home to Royal Crown Derby since 1878. The main link between the different sites and high-quality craftsmanship synonymous with Royal Crown Derby today has been the loyal and skilled artisan workforce. To celebrate this why not discover the story of the painter, James Rouse Senior, the only person to have worked in all three factories in Derby. James Rouse was born in 1802, the son of William Rouse and Sarah Hallam. 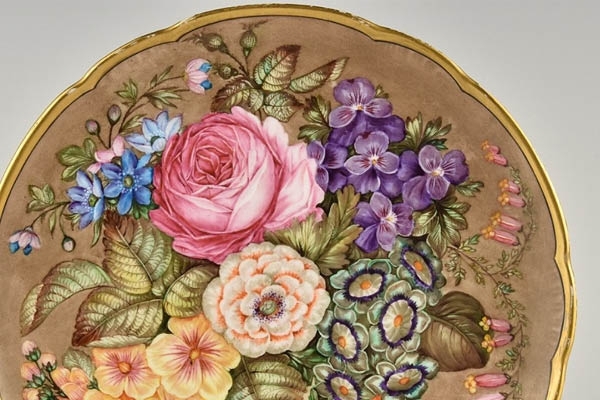 He was baptised at Saint Alkmund’s Church in Derby in February 1803 and started his career as an apprentice flower painter at the Nottingham Road factory site in about 1815. His artistic talent was soon noticed by his peers, in the book ‘The Old Derby China Factory’ written by John Haslem in 1876 he says ‘when he served his apprenticeship at the Old Factory he worked in the same room with Pegg the Quaker, Robertson, Cotton, Corden and others,’ and that ‘when the days work at the factory was over, Rouse and others of the boys were in the habit of attending at Pegg’s house, where he seemed to take great pleasure in giving them lessons’. Unfortunately, artists rarely signed their work during this period, so work by Rouse from this early period is difficult to identify. 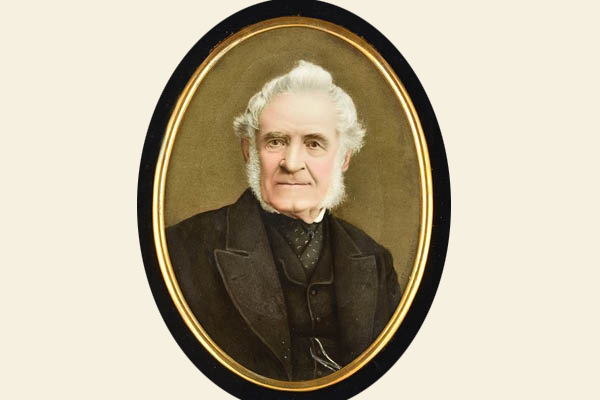 Rouse then left the Nottingham Road factory in about 1830 and worked in the Potteries and at Coalport for several years, before returning to work for Royal Crown Derby in 1875 to work for Sampson Hancock the proprietor of the King Street Factory, Derby. It is still possible to find pieces from his time at the King Street factory. 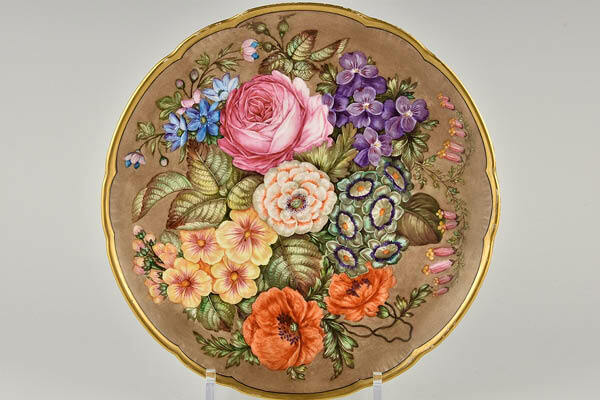 Proudly displayed in the Royal Crown Derby Museum based at the Osmaston Road Factory is a plate signed ‘J. Rouse Sen.’ from this period of time. 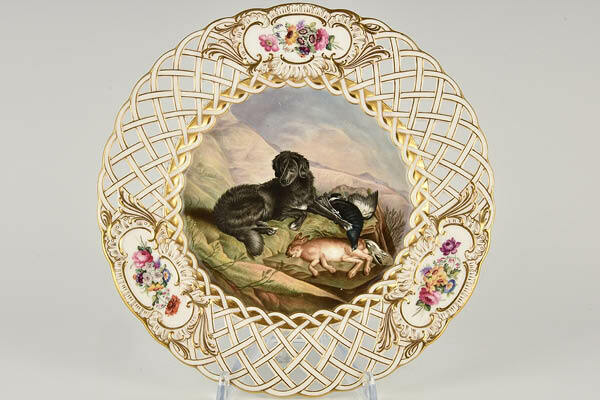 The cabinet plate has a pierced border and three panels with intricate hand painted flowers and a central painting of a gun dog. In 1882 he moved to the Osmaston Road factory. By this time, he was 81 years old. At this age, he was still able to produce some very high-quality work. 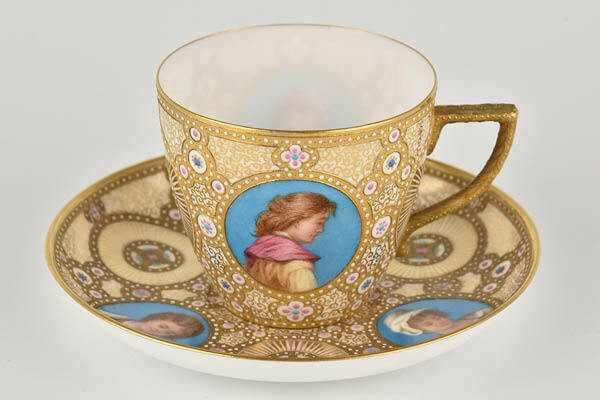 The delicate eggshell cup and saucer depicted below dated 1884 is assigned to J Rouse in the pattern book. It shows his versatility as an artist, as he could move from painting flowers to animals to portraits with ease. The ability to turn your hand to painting anything that is required is an important quality in the fine bone china industry. When the Liberal working men of Derby ordered a special china dinner service to be given to Prime Minister Gladstone in 1883 to celebrate 50 years of public service. James Rouse was chosen to paint the flower panels on the design. The service consisted of 26 pieces painted with central views of Derbyshire by Count Holtzendorf. Unfortunately, before completing the service Rouse suffered a stroke and was unable to finish it. This was the end of a long and accomplished career with Royal Crown Derby creating some of the finest and intricate designs by hand on fine bone china. He died in 1888, aged 87. Royal Crown Derby’s accredited museum provides a wonderful collection of fine bone china pieces displaying the skilled artisanal craftsmanship of Royal Crown Derby’s workers spanning over 260 years of manufacture. Discover Royal Crown Derby’s history whilst perusing the museum’s remarkable collection from the extensive archives to the current exhibition ‘High Society’. 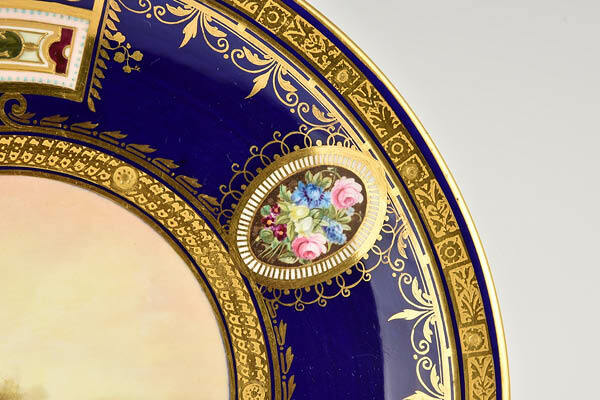 The exhibition tells the story of Royal Crown Derby’s heritage as well as showcasing the company’s connections to the capital and its members of the high society. For opening times and further information about Royal Crown Derby’s museum and the Visitors Centre please click the link here.